A craft beer on a warm summer day tastes great. But after a day spent slaying singletrack with buddies, swapping out leads with a climbing partner, or hiking with the family, that beer tastes even better. Long ago, some brilliant outdoor enthusiasts paired beer with outdoor adventure and ever since it’s been a marriage made in heaven. In fact, the same thing could be said about food. Towns like Abingdon, Damascus, and Bristol have capitalized on this après-adventure market, growing their microbrewery and restaurant profile dramatically. Here is your guide to the best trail-to-tavern pairings in the region. Established in 2009 and named after Daniel Boone’s original name for the surrounding area that became Abingdon, Wolf Hills Brewery has turned into the place to visit for craft beers and live music after a long day pedaling the Virginia Creeper Trail, the renowned 34-mile bike trail with its western terminus in Abingdon. Wolf Hills’ Creeper Trail Pale Ale is a perfect post-ride brew that will have you reliving the highlights of the day and sharing stories and laughs with fellow adventurers in the region. Damascus is known as Trail Town USA thanks to its proximity to the Appalachian Trail, the Virginia Creeper Trail, the Iron Mountain Trail, and the Trans American National Bicycle Trail. It’s also the gateway town for the Mount Rogers National Recreation Area, which features the highest peak in the state. 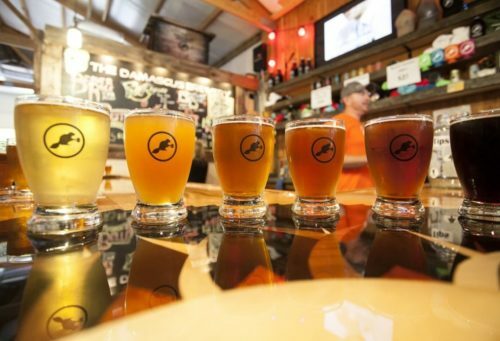 Hikers and cyclists in the know head to Damascus Brewery to sample the small-batch craft beers after a long day in the woods. Damascus Brewery’s, D-town Brown Ale, The Rye Crosser Rye Pale Ale, and Backbone Bock have helped to soothe many sore legs and ignited future adventures in the region. Bristol Brewery, located a little more than 15 miles south of Abingdon on I-85 in downtown Bristol, makes the perfect stop after trashing yourself climbing on the newly opened sandstone crag, Hidden Valley. Hidden Valley, located about halfway between Abingdon and Bristol, hosts more than 200 routes on bullet sandstone. The climbing runs the gamut from overhanging thuggery to thin delicate crimp work. Regardless of what and how much you climb, Bristol Brewery beers like the Vanilla Imperial Porter, Piedmont Pilsner, Bearded Goat Bock, and the heady Double Loco Imperial IPA are sure to soothe those worked tendons and back muscles. You’ll soon be hatching future plans to send that one route that shut you down. While hiking and navigating through the rock corridors and labyrinth-like maze of boulders on the 6.6-mile, out-and- back Channels Trail, one will build up a hearty appetite. Luckily for you, the neo-Appalachian inspired, farm-to-table Harvest Table in nearby in Meadowview, Virginia, can help you refuel after your backcountry adventure. Harvest Table sources its food by working with local farmers, breweries and wineries. It tries to keep its carbon footprint as low as possible and chooses seasonal foods to highlight in the ever-changing menu. Expect a healthy, organic, high-quality menu that will be an extension of Appalachia itself. Sugar Hollow Park, located within minutes of Studio Brew, is a great place to explore singletrack on two wheels. With the help of the International Mountain Bicycling Association, the trail system is getting even better and becoming more mountain bike-specific. 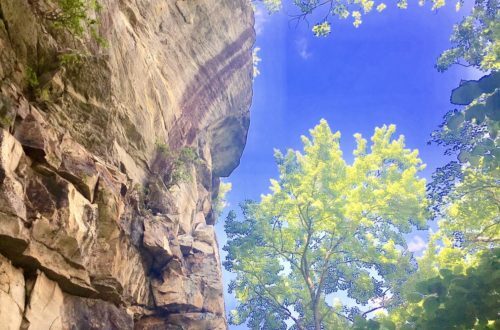 Trails like Raccoon Run, Fox Trot, Cave Loop Trail, and Salamander Trail make up a good loop that has just about as much climbing as descending. When you’ve had enough fun for the day, head over to Studio Brew, a brew pub that offers craft beers and artisanal pub fare to go with it. Beers like Dark Rider, The Dragon’s Lair, Mischievous Solstice, and Dancing Monk are all strong brews, yet perfectly balanced and with the suggested food pairing that will have you grinning from ear to ear, reliving the perfect day you’ve just had.